As all enthusiasts know very well, cigars lose freshness with time. With this freshness, flavor and aroma are also lost, resulting in a subpar cigar that is not as pleasurable to smoke. Even though this can’t be avoided, however, there are ways in which you can extend the lifespan of your cigar. To be used properly, a humidor needs a second device that monitors humidity and temperature. This device is called hygrometer, and it’s incredibly useful. In order to help you understand more about it, this Buyer’s Guide will go over the characteristics of three stand out digital hygrometers for humidor. Additionally, it will answer important questions about devices of this kind. As previously mentioned, using an old wooden cigar box may be the most romantic and idealized way to store your cigars. Nonetheless, it’s not the most efficient. As all serious cigar enthusiasts know very well, a humidor is the best answer for keeping your cigars moist enough to retain the flavor while burning efficiently. However, owning a humidor is not going to do much unless you know exactly how to set its temperature precisely right. This is not so easy, however, according to your personal needs and preferences. For that reason, products such as the Caliber IV Digital Hygrometer by Western Humidor were designed to precisely and accurately measure the moisture inside a humidor, allowing users to adjust its levels to perfection. Building upon the importance of measuring moisture with precision, it can be said about this product that it is incredibly accurate and reliable. As a matter of fact, it has an accuracy level of +/- 1 percent. By comparison, most analog and cheaper products of this kind have an accuracy level that is around ten times lower. Not without a good reason, this hygrometer for the humidor is used by cigar aficionados and industry professionals. This device is so precise, in fact, that it is even used by cigar makers to control and adjust their product storage conditions in order to conserve freshness, flavor and overall quality for extended periods of time. In order to have a precise reading of the levels of moisture in your humidor box, you only need to be sure that this device is well-calibrated. Luckily, the Caliber IV Digital Hygrometer by Western Humidor is very easy to calibrate and adjust. Aiming at making the entire process of checking the moisture in their humidor easier for beginners, the Caliber IV Digital Hygrometer by Western Humidor is perfectly calibrated when you take it out of its box. However, its manufacturer does recommend calibrating this hygrometer before using it for the first time. This can be done in various ways. However, it is advisable to calibrate it using a calibration device such as a Bovada calibration kit. Because it requires buying yet another item, this may be considered problematic by some customers. Nevertheless, it should be mentioned that all hygrometers (digital and analog) need to be calibrated regularly in order to produce reliable readings. Apart from being very efficient, the Caliber IV is easy to operate and read. At the same time, it is compact and ergonomic in its design, two characteristics that allow this device to become a part of your humidor without any problems, spatial or otherwise. At only four inches in length, it fits in all humidors without taking space that could be used to store more cigars. In order to be securely placed, this product features a magnetic adhesive strip that is both powerful and durable. Even though this is not the most impressive feature, it is very practical and convenient as it allows you to pop it out of the box and use immediately. More accurate delivering readings than most similar products on the market. Capable to give humidity and temperature readings. Switches between Celsius and Fahrenheit. Gauges between 20 and 90 percent relative humidity. Its temperature readings are not as precise and reliable as its humidity readings. For inexpert users, traditional hygrometers can be difficult to read. Furthermore, even if correctly read, traditional hygrometers will not tell you how to optimize any given environment. Fortunately, apart from providing hard data, this product by AcuRite offers recommendations for modifying a place in order to get the best results possible. Despite being incredibly compact, the AcuRite 00613MB is effective, and it provides a variety of data forms that will help you keep temperature and humidity at optimal levels. What is more, this device is highly customizable according to your preferences. For example, it allows you to choose between Fahrenheit and Celsius when it comes to the temperature display. Without a doubt, one of the most notable characteristics that this product has is its compact size. Despite being so small, however, this device is incredibly accurate both in its measurements and its data display. As a result, it can be used either as a fixed device in your home or as a portable tool for measuring temperature and humidity on the go. Apart from being compact, the AcuRite 00613MB has a smart design that allows it to be easily placed anywhere. Using a cleverly placed magnet, the device can be mounted on metallic surfaces such as the door of your fridge. What is more, it also includes a stand that can be folded in or out for extra convenience. 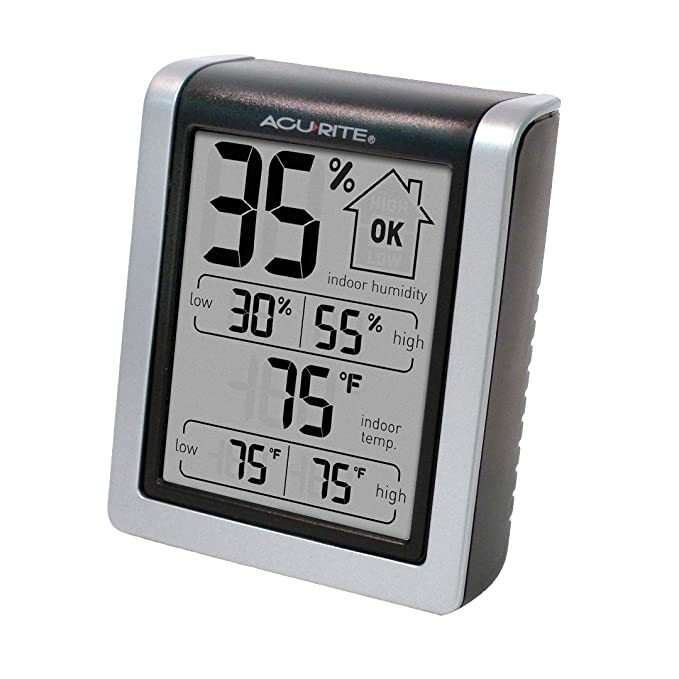 Without a doubt, the AcuRite 00613MB is a great digital hygrometer. Accurate, compact, portable and effective, it can make a huge difference when it comes to monitoring different environments. Unlike more traditional hygrometers, this small computer can even provide complex assessments that you can use to modify and optimize different environments. Even better, this device is very affordable, allowing you to purchase various on them in order to get more coverage. Provides insights that can help you manage environments more efficiently. Includes magnet for easy mounting. Not well-suited for use in environments that are too humid. Constantly monitoring the humidity levels of certain places can be a real hassle. Apart from being incredibly time and energy-consuming, keeping humidity at adequate levels in your humidor, refrigerator, crawlspace or anywhere else can be difficult due to all the variables it presents. Luckily, this digital hygrometer by SensorPush is here to make it easier and more convenient to ensure that humidity is at the right level at all times. Directly connected to your smartphone, this device can help you monitor the levels of relative humidity remotely. Using various of these digital hygrometers by SensorPush, you can monitor your entire home’s humidity levels. This is made possible due to the device’s powerful Bluetooth signals. Connected directly to your smartphone via Bluetooth, each one of these devices can provide direct information not only about humidity but also temperature. The SensorPush Wireless Thermometer/Hygrometer includes an app that features a simple and yet effective interface. 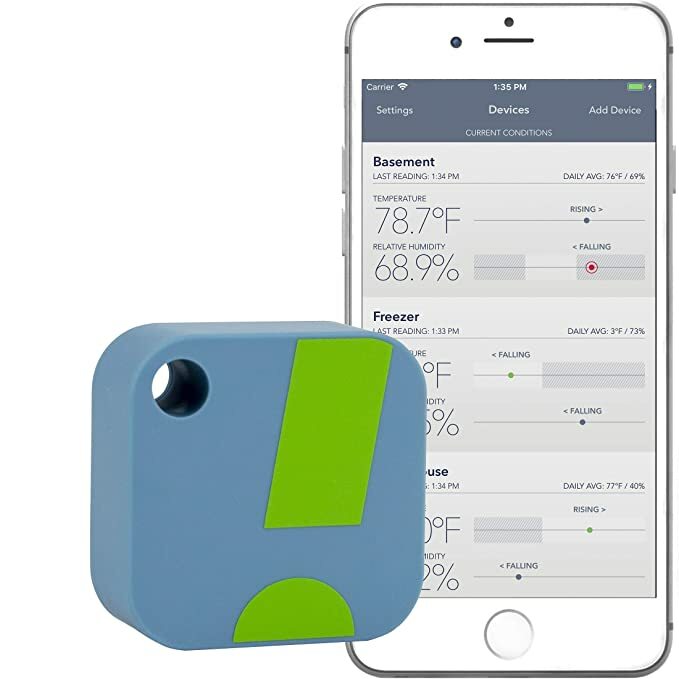 This interface allows you to view the humidity and temperature levels of a specific place. What is more, this product can be used to keep a constant eye on the functioning of humidors and similar devices, ensuring that your temperature and humidity-sensitive goods will remain in good condition. Apart from displaying the current levels, the app provides additional information such as daily averages and sudden changes. Even better, by adding a SensorPush G1 WiFi Gateway to your device, you can get notifications and alerts through the internet anywhere you are. If you are a lover of complex data, this digital hygrometer may be perfect for you. Apart from hard, cold numbers, the device’s app is capable of providing beautiful, easy to read graphs that will show you the flow of humidity and temperature in a specific location over time. If you need to, you can even export this information as a CSV document in order to be opened with software such as MS Excel. Incredibly, all the data that is provided by this device is updated on a minute-by-minute basis, allowing you to monitor the humidity and temperature of your humidor (or anything else) with remarkable precision. With everything on the table, it becomes quite clear that this SensorPush product is as useful as it is innovative. Allowing you to track the humidity and temperature of important locations remotely, this device can truly make your life easier. Even better, it can help you improve your settings by providing detailed data for you to analyze. All in all, this is a very impressive digital hygrometer. Provides useful graphs and data. Gives alerts and notifications through the internet. Various devices can be connected to a single smartphone. Not precise in settings with high humidity/temperature fluctuations. Apart from ensuring that your cigars will remain flavorful, fresh and easy to burn, a hygrometer can prevent external hazards such as beetles and mold from damaging your favorite smoking material in an irreversible way. However, most cigar enthusiasts are not interested in performing an almost-scientific analysis every time they need to check the moisture of their humidor. For that reason, products such as the HygroSet II Round Digital Hygrometer for Humidors place an emphasis on simplicity, readability and overall straightforwardness. Compared to the Caliber IV Digital Hygrometer by Western Humidor and, frankly, most other hygrometers on the market, this product is remarkably small and simple in its design. As a matter of fact, this efficient and reliable device is so small that it can fit in basically any nook or cranny in a humidor. Largely, this ability to be placed anywhere has to do with its slim profile and round shape. These two characteristics make provide a great economy in volume without sacrificing functionality, ergonomics, readability or overall quality. Going a bit further regarding the simplicity and efficiency of this product’s design, it can be mentioned that, despite being very straightforward, its display is very intuitive and easy to understand. Additionally, it is quite large, particularly considering the compact size of the device itself. As a result, it can be used without problems by people that have visual difficulties when it comes to reading small displays. Not only that, but the HygroSet II Round Digital Hygrometer for Humidors can be operated and calibrated with only a few pushes of its three multi-function buttons. Even though this may seem like a daunting task at first, after reading the instructions that are included with the purchase of this product, you will be an expert. At this point, it would probably be important to mention that many of the comments about this product featured on review sites marveled about its affordability. Despite being between five and ten dollars cheaper than most other high-quality products of its kind, however, the HygroSet II Round Digital Hygrometer for Humidors had earned excellent reviews by both customers and specialized critics, including experienced cigar enthusiasts. While this affordability may be partially attributed to the device’s size, this characteristic does not entail either a lack of quality or a scarcity of features. In fact, the HygroSet II Round Digital Hygrometer comes with all the features you could possibly want, including batteries, a magnetic strip for easy placing and a useful mini-soundboard that makes interaction easier and more precise. Surprisingly affordable despite a high level of quality. Compact enough to fit anywhere in a humidor. Features a 10-second refresh rate that helps control humidity at all times. Large display for people with eyesight problems. Easy to control and calibrate. Only needs to be re-calibrated once a year. Does not come calibrated out of the box. Its small dial button can be difficult to control with the necessary level of precision. Even though it is not as advanced in terms of control and readability as the other two products featured in this guide, the Caliber 4R Gold Digital/Analog Hygrometer manages to be user-friendly and efficient. Largely, this has to do with its color-coded reading system. While the product’s display is not the most visually-alluring available on the market, its color-coded design makes it both intuitive and easy to understand, allowing first-time users to begin monitoring the humidity in their humidor as soon as the product comes out of the box. As if this wasn’t enough on its own, the Caliber 4R Gold Digital/Analog Hygrometer features a gold antique compass-styled look that makes it, by far, the most visually-alluring product on this list. Like most products of its kind, this device offers both temperature and humidity readings that can be switched between Celsius and Fahrenheit with the push of a single button. Apart from providing a precise +/- 1% level of accuracy at all times, the Caliber 4R Gold Digital/Analog Hygrometer provides other pieces of data that may be crucially important for advanced cigar enthusiasts to precisely monitor the levels of humidity in their humidors. Without a doubt, one of the most important is the three-day high/low/average data display because it provides important information regarding humidity levels over extended periods of time. It should be mentioned that most of the complaints directed at this product will have to do with its subpar display. Featuring dimensions of 2.7 x 2.6 x 1 inches, this is, by no means, a large device. While this characteristic may be beneficial in many ways, it does not pair well with the low resolution and underwhelming brightness of this product’s display. Due to these two aspects, the display is very difficult to read in certain conditions. With full disclosure in mind, it can even be said without exaggeration that reading this display at an angle can be problematic. Unfortunately, trying to read it under in broad daylight is also out of the question. Despite its most visible faults, the Caliber 4R Gold Digital/Analog Hygrometer is a complete, efficient and reliable piece of technology that will undoubtedly help you keep your cigars in their best shape. Stable, durable and easy to calibrate, it is certainly a reliable device. At any rate, the aesthetics and ergonomics of this device alone would be enough to draw the attention of most cigar aficionados. Even though it’s not the most compact on the market, its elegant compass-like design will not look at out of place in the midst of any cigar collection. Only needs to be re-calibrated once every two years. Color-coded system makes for easy reading. Looks like an analog hygrometer but has the functionalities of a digital hygrometer. Features a secure magnetic mount. Its gold encasing makes it look classy. Its display is not bright enough to be read in the daylight or at an angle. May require velcro to help attach it inside a humidor. Simply put, a hygrometer is a device that measures the level of humidity (moisture) that is in the air at any given time and place. This kind of device can be used for various specific purposes in mind, or simply as a means to monitor humidity in a room (for example, a hospital waiting room). For the purposes of this buyer’s guide, however, we will discuss digital hygrometers in terms of their use for humidors. At this point, it should be mentioned that, typically, digital hygrometers are used in combination with one other device: A humidification device. Employing both these devices, a cigar aficionado can ensure that its cigar collection will remain fresh and delicious for extended periods of time. One of the most important things to understand about a hygrometer is that it only serves to monitor temperature and humidity levels in a certain area. That means that, by itself, a digital hygrometer for humidor does not have the ability to regulate temperature or humidity. However, it does provide a reliable and immediate reading of these factors that can help users correct and adjust the environment in order to have the perfect conditions for maintaining cigars fresh and flavorful. When asked about keeping cigars fresh, most people imagine the classic wooden box setup that was popularized in movies and pop culture in general. However, the old-school wooden box may actually be one of the best ways to ensure your cigars will become stale and dry in no time. The truly knowledgeable way to maintain your cigar collection fresh, on the other hand, is a cigar humidor. A cigar humidor is a storage container that is designed to maintain a certain humidity level despite external conditions such as the weather. At the same time, cigar humidors help maintain the temperature within a certain range in order to prevent problems such as mold or frostbite. Cigar humidors are vital for keeping cigars fresh and moist. This is important because the tobacco leaves that make up a cigar have the ability to contract and expand depending on the level of humidity that is in the air around them. Apart from varying in size, cigars that gain or lose too much moisture will be subject to various changes in their physical integrity. Logically, these changes will result in variations in flavor, aroma, burning abilities and overall quality. Without a doubt, however, the biggest problem that comes with variations in the physical attributes of a cigar is its drying up. When tobacco leaves dry up, they become shriveled and lose a good amount of their characteristic aroma and flavor. As if that was not bad enough, dried up tobacco leaves will burn too hot and quickly, making the cigar difficult to smoke properly. On the other hand, cigars that are too moist can be difficult to burn and smoke. Additionally, too much moisture can lead to problems such as mold and rot. That is not all, however, as these problems can also attract a dangerous species of beetle known as the tobacco beetle. Because of their voracious disposition, once these animals get in your cigar collection, you can say goodbye to it. What are the Additional Uses of a Hygrometer? Controlling humidity in a room for medical reasons. Minimizing humidity in order to control mold growth. Reducing the danger of viruses, bacteria, dust mites, fungi and other asthma-inducing agents appearing. Creating an apt environment for indoor plants to healthily grow. Protecting expensive equipment from being ruined by excessive humidity. Essentially, there are two types of hygrometers: digital and analog. Analog hygrometers are the most ubiquitous. In order to designate the metrics, these hygrometers typically use arrows that move and point to a certain number in a wheel. Very often, humidor containers will include an analog hygrometer as a part of its setup. For that reason, it may be tempting to trust them. However, it should be remarked that analog hygrometers tend to be a lot less accurate than their digital counterparts. As if that was not bad enough, analog hygrometers are very difficult to calibrate properly. For that reason, many cigar experts completely disregard their use, choosing instead to trust a digital hygrometer such as the ones featured in this guide. How Can You Calibrate Your Hygrometer? In order to make sure that the humidity and temperature readings provided by your hygrometer are accurate, you need to calibrate the device with a certain level of regularity. To do this, you need to purchase a calibration kit. Once you have this device, simply place your hygrometer in a Ziploc bag. Next, seal the bag and place it in a dry and dark place. After 24 hours, take out the hygrometer and compare its reading to that of the calibration kit. If there is a difference, simply adjust the hygrometer to match the calibration kit. What is the Best Humidity and Temperature for Keepings Cigars Fresh? Without a doubt, there is a great deal of controversy regarding the best humidity for keeping cigars fresh. Even though there are many experts that have very definite opinions regarding this subject, there is no consensus among them. In the end, it all comes down to personal taste. However, typically, cigar vendors and enthusiasts recommend getting as close as 70 RH% per measure. When it comes to Cuban cigars, though, many of the same experts will recommend going down as far as 65 percent. Regarding temperature, typically, it is advised to get the humidor going at around 70 degrees Fahrenheit. This too, however, depends largely on personal taste. How Long Can You Keep a Cigar Without a Humidor? Typically, a cigar will not last very long unless it is stored in a humidor. However, the amount of time that it will remain fresh can be stretched slightly by putting the cigars in a sealed Ziploc bag. As an additional measure, you may place the Ziploc bag inside a Tupperware container, which will give you some extra hours. At any rate, if you do not have a humidor, you should get one as soon as possible. Until then, however, try to smoke your cigars within the first two or three days of buying them. Can You Revive a Dry Cigar? To a certain extent, yes. Cigars can be re-humidified by being placed in a humidor for a certain period of time. Typically, this period of time ranges between one week and three weeks. Largely, the amount of time needed for a cigar to be revived depends on both its thickness and how dry it is. At this point, it is important to note that you should never increase the humidity in your humidor hoping to speed up the re-humidification process. If you do this, it is likely that the violence of the process will end up tearing holes in the cigar’s wrappers. What is Dry Boxing and How Can You Do It? Simply put, dry boxing is the act of putting a cigar in a wooden box for a few hours before smoking it. The reason for doing this is that it eliminates the probability of the cigar burning incorrectly due to being plugged. It should be pointed out, however, that this is not an issue that all cigars have. As a matter of fact, all cigars are different and, as a result, they need to be treated in a particular way. Should You Take the Wrapper Off Cigars Before Putting Them in a Humidor? Again, this is a matter of preference. However, it should be noted that most cigars are wrapped in cellophane, a porous material that allows them to breathe and maintain their humidity. For that reason, many cigar experts vote against taking the wrapper off of cigars before putting them in a humidor. Hopefully, having gone through this guide, you have a clearer understanding of what a digital hygrometer can do for you and your cigar collection. At any rate, you will be able to compare some of the best digital hygrometer products on the market, making it easier to choose the best one for you.